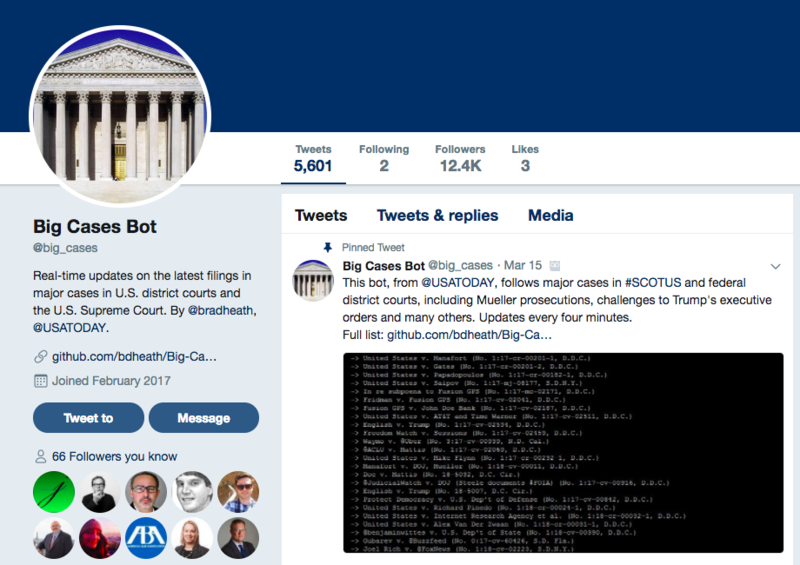 The aptly named Twitter robot Big Case Bot automatically follows selected U.S. Supreme Court, U.S. Courts of Appeal, and Federal District Court cases of note and posts documents from new docket entries to Twitter. U.S. Courts of Appreal and Federal District Court documents are pulled from PACER. U.S. Supreme Court documents are pulled from another source. The documents are included as attachments to the tweets. ACLU v. Madison County, Miss. Note that some federal district courts -- including those in the Eastern District of Virginia, the District of Maryland and the District of Hawaii -- have elected not to publish an RSS feed from their dockets. As a result, Big Cases can't follow cases in those districts. Most federal courts of appeal also do not pulbish [sic] RSS feeds of new docket entries. Big Case Bot was created by USA Today investigative reporter Brad Heath. In his Twitter bio, Heath descibes himself as, "covering law and justice. Data, documents and 'convoluted KGB style back-door' stuff." The bot utilizes the Python programming language. Anyone can download and customize the code (using their own PACER and other login credentials) to download documents based on parameters they set. Note that according to the bot's documentation, the Big Case Bot code, "has only been tested on a machine running CentOS Linux 7."